Routine heart transplants have been suspended at a leading hospital after a rise in the early deaths of patients. This year seven of the 20 adult heart transplant patients at Cambridgeshire's Papworth Hospital - or 35% - have died within 30 days of their operation. The hospital says the UK average death rate is 10% and its normal rate is 7%. The Department of Health has advised suspending operations pending a review. Lung transplants and other operations are being carried out as normal. Stephen Bridge, the hospital's chief executive, said: "It's expected 10% of heart transplant patients die within 30 days. "We've normally been around 7%, so below the national average." He said they were talking about "comparatively small numbers" but it was agreed the Healthcare Commission should undertake an external review to see if there are improvements that can be made. "The Department of Health has responded to this very quickly by sending in a team of independent experts to help us review our heart transplant service," said Mr Bridge. "The review is being conducted to help us identify what, if any, action needs to be taken. "We would like to reassure everyone this review applies to routine heart transplantation only. ''Various measures have been taken over the last couple of weeks but it was really literally late last week that that trigger point was really exceeded. Mr Bridge said the last heart transplant had been carried out last week and the seventh patient had died on Monday. The review, which will last two weeks, will look at the individual case notes of those who died after a heart transplant to check the quality of care and to see if there were any common factors. It will also look at how care is provided from the patient's first contact with the trust to post-operative care and will ensure the transplant service is linked "appropriately" to the rest of the organisation. Patients on waiting lists and others affected directly by the review have been informed. Mr Bridge said that if an emergency were to arise then the medical team could carry out a heart transplant. A heart valve reconstruction operation televised live from Papworth Hospital and watched by 250 people at the Wellcome Collection in London went ahead as planned on Thursday night. 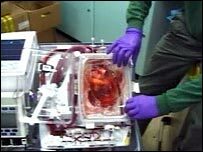 Last year surgeons at Papworth performed the UK's first "beating heart" transplant where the organ was kept supplied with blood until it was inserted into the patient. The hospital is asking patients or relatives with concerns to call 01480 830541. What could be wrong at Papworth?